This afternoon the eastern kingbird is back, spending the last hour before sundown hawking insects over the pond. 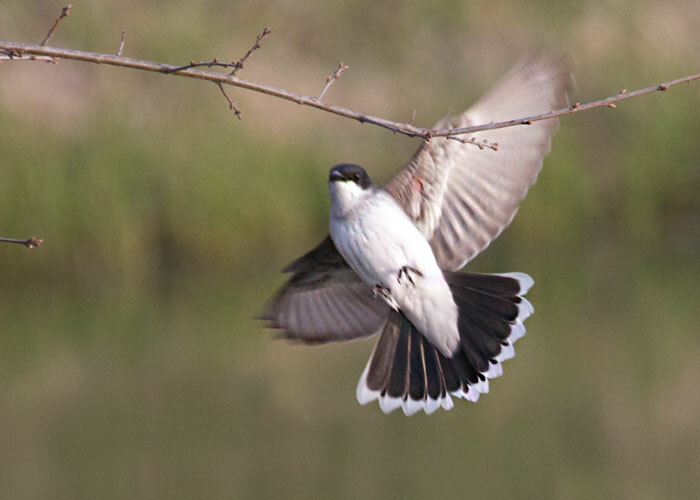 After each fancy flight, it returned to a branch and flashed open its white-rimmed tail. Isn't the pattern intricate, with little beads of black within the white margin? The Talon 8x42 binocular, from Vortex Optics, offers an open bridge design. It lets you wrap your fingers around each barrel. This contributes to a steady image, which results in your seeing a more detailed picture. You also get a remarkably wide field of view, too — 425 feet at 1000 yards. Its eye relief of 18mm means it works great for people who wear glasses (as well as for those who don't). Focuses as close as 6 feet! Thayer Birding Software's Gold Edition DVD is the ultimate resource for bird information. 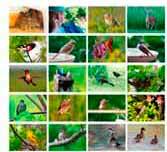 Use it on your PC computer and enjoy photographs from world-class nature photographers along with songs, sonograms, action videos and detailed range maps.